(Read at Totnes, July, 1880). In May, 1879, Mr. W. Nosworthy, of Manaton, a member of this Association, invited my brother and myself to his house to examine some coins which had recently been found in the roof of an old building close by, of which Mr. Pengelly gives us an account. Whilst at his house Mr. Nosworthy showed us a very fine silver tankard, apparently a whistle tankard, which had been in his family for several generations. This tankard, which would probably hold about three pints, had two very curious engravings on it, and between them a coat of arms. 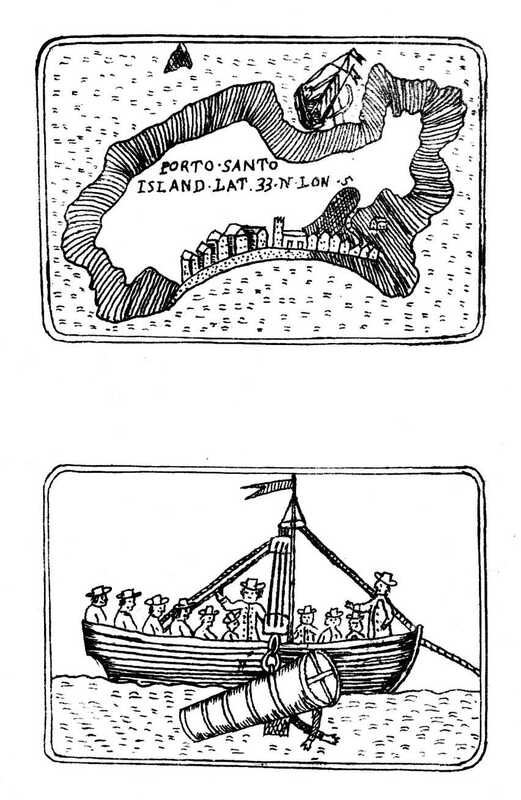 On the one side the engraving represented an island with a town on it, and the words PORTO SANTO ISLAND, LAT. 33 N. LON. 5; and on the other side was a barge on the sea full of men, from which was being raised or lowered a large conical object, at first sight not unlike a large cannon. On the handle were the following initials, L / IE. During the last century it was usual to place initials in this way, the single letter on the top being the initial of the surname, and the letters below those of the Christian names of the man and his wife. Mr. Nosworthy had been unable to get any clue to the meaning of these engravings, nor did he know to whom the initials referred. Having heel-ball and suitable paper with me, I was enabled to take some rubbings. Referring to my heraldic index I found that the arms – viz., a bridge of three arches turreted, in chief an eagle displayed – probably belonged to a Lethbridge; this was further supported by the letter L in the initials. * Vol. ii., p. 568. “At this place lived Mr. John Lethbridge, not so well known as he deserves to be, as the ingenious inventor of a diving-machine, by which he was enabled to recover goods from wrecks at the bottom of the sea, without any communication of air from above.” Porto Santo was also mentioned as one of the places where he had dived on wrecks. From this I was convinced that I had found my man, and that the curious object engraved on the tankard was his diving-machine. Thinking an account of him might be interesting, I shall give all the particulars that I have been able to gather about him. It appears that a Mr. Symons, of Harberton, near Totnes, claimed to have invented a diving-machine, and in a letter written by a Mr. Ley, to the Gentleman’s Magazine, July, 1749, accused Mr. Lethbridge of robbing him of his invention; thereupon Mr. Lethbridge writes to the same magazine denying the accusation, and giving a full account of his own invention. If it had not been for these letters we should probably have lost all traces of its history. Mr. R. Dymond having with his usual kindness copied the longest of these letters for me from the Gentleman’s Magazine, I am enabled to give them in full. ” A DESCRIPTION OF A DIVING-SHIP MADE SOME YEARS SINCE BY NATHANIEL SYMONS, OF HARBERTON, NEAR TOTNE8. “Mr. Symons was a common house carpenter, of Harberton, who invented a diving-boat as follows: ‘Though I did not see it I shall trouble you with such a description as my memory will permit, after so long a time as twenty years, and which I had from the inventor himself. “‘He made his boat in two parts, and joined them in the middle very tight with leather, that no water could get in; he made a false door in the side, which, when he was in, shut very tight; and though his going in admitted a small quantity of water, it was no inconvenience. After this outer door was shut he opened the inner one to get into his boat. “‘ There was more than fourscore weight of lead to the bottom of his boat (but this I presume must be according to the dimensions of the boat). Though the boat would swim when extended to its full dimensions, yet he had a screw to each side of his boat, which, when within it, he could manage himself and which, by means of the leather that joined the parts of the boat, contracted them to that degree that the boat would sink. “‘ He went into the middle of the river Dart, entered his boat by himself in sight of hundreds of spectators, sunk his boat himself, and tarried three-quarters of an hour at the bottom; and then by extending it with his screws he raised it to the surface again without any assistance. He said that though at last the air began to be thick he could bear it very well. “‘This same person invented the famous diving-engine for taking up of wrecks, though his cousin L—e deprived him of both the honour and profit. “‘And though a great number of gentlemen of worth were present at shewing his boat, he told me he received but one crown piece from them all. I think he has been dead some years. “‘ Yours, &c, Samuel Ley. * Gentleman’s Magazine, 1749, vol. xix. p. 312. “Mr. Urban, – Having observed in your magazine for July, p. 312, a description given by Mr. Samuel Ley, of Lamorran (to whose person and residence I am an entire stranger), of a diving-boat, invented some years since by Mr. Nathaniel Symons, of Harberton, near Totness, in Devon, a house carpenter; and Mr. Ley having asserted that Mr. Symons invented the famous diving-engine for taking up wrecks, though his cousin, L—e, and some others, deprived him both of the honour and profit; and as I am the first inventor of a diving-engine in England, without communication of air from above, I therefore presume Mr. Ley means me, under the title of Mr. Symons cousin L—e (to which kindred I have not the least pretension). Now, whether the assertion proceeds from prejudice, or false information, I will not determine; but whatever may be the motive, I think it incumbent on me to give an answer thereto, which shall be genuine. And, first, as to the diving-boat insisted on I shall say nothing of it, having never seen it, nor ever heard that it was anywise serviceable, but readily agree with Mr. Ley, that his account of it is imperfect; and as to the famous diving-engine, which Mr. Ley is pleased to say was invented by Mr. Symons, I take the liberty to aver it is my own invention. It is observable that Mr. Ley is silent with respect to its description; but as it hath been of such singular service to the public I shall here insert a particular description thereof with the principal motive of the invention. Necessity is the parent of invention, and being in the year 1715 quite reduced, and having a large family, my thoughts turned upon some extraordinary method to retrieve my misfortunes, and was prepossessed that it might be practicable to contrive a machine to recover wrecks lost in the sea; and the first step I took towards it was going into a hogshead, upon land, bung’d up tight, where I stay’d half-an-hour without communication of air; then I made a trench, near a well, at the bottom of my orchard in this place in order to convey a sufficient quantity of water to cover the hogshead, and then try’d how long I could live under water without air-pipes or communication of air, and found I could stay longer under water than upon land. This experiment being try’d, I then began to think of making my engine, which was soon made by a cooper in Stanhope Street, London, of which you have the following description: ‘It is made of wainscot perfectly round, about six feet in length, about two foot and a half diameter at the head, and about eighteen inches diameter at the foot, and contains about thirty gallons; it is hoop’d with iron hoops without and within to guard against pressure. There are two holes for the arms, and a glass about four inches diameter, and an inch and a quarter thick to look thro’, which is fixed in the bottom part, so as to be in a direct line with the eye, two air-holes upon the upper part, into one of which air is conveyed by a pair of bellows, both which are stopt with plugs immediately before going down to the bottom. At the foot part there’s a hole to let out water. Sometimes there’s a large rope fixed to the back or upper part, by which it’s let down, and there’s a little line called the signal line, by which the people above are directed what to do, and under is fix’d a piece of timber as a guard for the glass. I go in with my feet foremost, and when my arms are got thro’ the holes, then the head is put on, which is fastened with screws. It requires 500 weight to sink it, and take but 15 pound weight from it and it will buoy upon the surface of the water. I lie straight upon my breast all the time I am in the engine, which hath many times been more than six hours, being frequently refreshed upon the surface by a pair of bellows. I can move it about 12 foot square at the bottom, where I have stayed many times 34 minutes. I have been ten fathoms deep many a hundred times, and have been 12 fathom, but with great difficulty.’ With this I dived 3 years before I saw Mr. Symons I solemnly declare, and I think I never heard of such a man till he came to the Lizard to see my engine, which he liked so well that he desired to adventure with me on some wrecks near Plymouth, where we adventured together without success. Sometime after this Mr. Symons reported, behind my back (but I declare never to my face), that he was the inventor of my engine; but I protest I never saw a diving-engine before I saw my own, nor did I ever see Mr. Symons’s diving-boat (as Mr. Ley calls it), nor ever saw him dive in an engine in my life, of all which I am ready to make and avir. As I have given a clear and just answer to the assertion, and offered to support it as strongly as any reasonable man can expect, I must, therefore, beg leave to observe the improbability of my stealing an invention from another man (and if Mr. Ley says true it is nothing less); for a man must be little otherwise than mad to try an experiment in a hogshead the very day and hour of the great eclipse in 1715, in order to contrive an engine of which he was master before. Now, this experiment in the hogshead is no fiction; for the person who assisted me dyed but three years since, and I appeal to his children now living here, and my well-disposed neighbours in general for the truth of it. I can’t conclude without remarking the absurdity of the assertion – I mean of taking away the honour and profit. Now, for argument’s sake, suppose I had taken the dimensions of Mr. Symons’s engine, and make one like his, as is alleged, would that have stopped his progress? Would he not (like an Englishman) have asserted his right, and proved me an imposter? Might he not have dived in the West Indies, at the Isle of May, at Porto Santo (near Madera), and at the Cape of Good Hope, as well as myself. But perhaps a stranger to him may object that he wanted either money or friends, to which I answer that he wanted for neither; and as for myself, in the beginning of my project, no man ever wanted for more of both. I could (if necessary) quote many gentlemen of considerable rank in this kingdom and Holland who are well acquainted with my capacity and veracity in this respect. “Newton Abbot, near Exon, Devon, September 19th, 1749. * Gentleman’s Magazine, vol. xix. (1749) p. 411. Compare Lysons’ Correspondence, Add. MSS., No. 9428, pp. 353–357, Brit. Mus. After Mr. Lethbridge had completed his machine he appears to have offered his services to some London merchants to adventure on the wrecks of some treasure ships then lately lost; but it was some time before he found any who had sufficient confidence in the success of his experiments to offer him terms at all adequate to his deserts and expectations; but after his success had been proved, he was employed to dive on wrecks in various parts of the world, both for his own countrymen and for the Dutch and the Spaniards. At the house of his grandson, John Lethbridge, at Newton, was a board, on which was an inscription, in gold letters, dated 1736, stating that John Lethbridge, by the blessing of God, had dived on the wrecks of four English men-of-war, one English East Indiaman, two Dutch men-of-war, five Dutch East Indiamen, two Spanish galleons, and two London galleys, all lost in the space of twenty years; on many of them with good success, but that he had been very near drowning in the engine five times. The apparatus, about the year 1800, was said to be at Governor Holdsworth’s, at Dartmouth, but in a decaying state. It is said his most laudable endeavours were so far crowned with success that he was enabled not only to maintain his family, but to purchase the estate of Odicknoll, in the parish of Kingskerswill. There is reason to believe that Mr. Lethbridge was the first person who, by his ingenuity and intrepidity, succeeded in recovering goods from wrecked vessels. Though Phipps’ diving-bell was a prior invention, there is no record of its having been successfully used for practical purposes. To again return to the subject of the tankard. The date of it from the plate mark appears to be 1676, many years before the invention of the machine, and I should therefore be inclined to think it is very probable that this tankard, amongst other valuables, had been recovered by Lethbridge from some wreck at Porto Santo; that he had received it in perhaps part payment for his services, and so had a sketch of both the island and the machine engraved on it; and thus it has now been the means of awakening fresh interest and enquiries on the subject. In conclusion, I wish to acknowledge my thanks to Mr. Nosworthy for allowing me to exhibit this valuable and interesting tankard to this Association.